Mother’s Day is an important day for Alcoholics Anonymous. It was on this day back in 1935 that Robert H. “Dr. Bob” Smith and Bill Wilson first met. 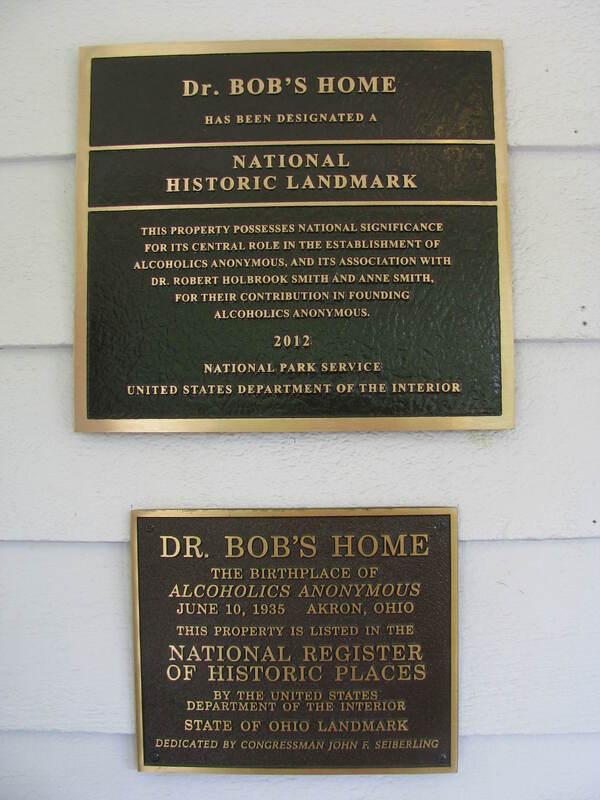 On this most recent Mother’s Day, seventy-eight years after the encounter that sparked a worldwide movement for sobriety, AA supporters gathered at 855 Ardmore Avenue in Akron, Ohio, to celebrate another milestone: the designation of Dr. Bob’s Home as a National Historic Landmark (NHL). As the authors of the NHL nomination, we were also celebrating. 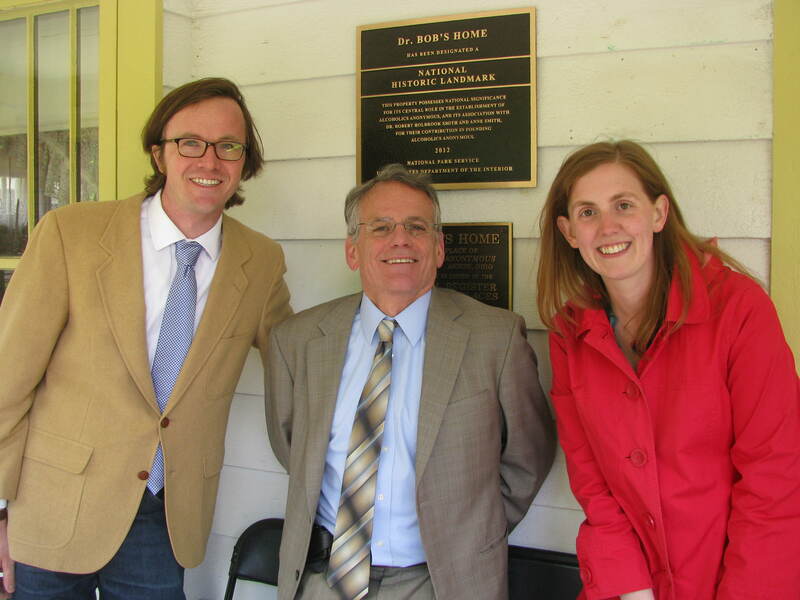 The recognition of Dr. Bob’s Home as an NHL marked the successful conclusion of an eighteen-month collaboration between Professor Michelle McClellan’s graduate seminar in public history and the stewards of Dr. Bob’s home, now a museum. Since our first trip to Akron in the fall of 2011, the project had come full circle. That initial whirlwind visit set the pace for an intense period of consultation, research, and writing back in Ann Arbor. Last May, our group journeyed to Washington, D.C. to present the completed nomination to the National Park Service’s (NPS) Landmarks Committee. Five months later, in October of 2012, the Secretary of the Interior formally designated both Dr. Bob’s Home and Stepping Stones, the long-time residence of Bill and Lois Wilson in Bedford, New York, as NHLs. This trip to Akron was to celebrate the designation. As we chatted with some of the hundred or so other guests in the backyard of 855 Ardmore, we witnessed firsthand the close ties of the local AA fellowship. Young families mingled with “old timers,” seasoned volunteers discussed future goals for the museum over coffee, and even out-of-towners like us received a homecoming welcome. While writing the nomination had familiarized us with the house and the history of AA, witnessing this sense of collective purpose and continuing commitment to Dr. Bob’s Home struck us as the most inspiring testament to the significance of the site in AA’s history and ongoing mission. As one o’clock approached, the crowd drifted to the front of the house for the official unveiling of the NHL plaque. Harmon Velie, chairman of the Founders’ Foundation (the organization that oversees the site), spoke about his personal connection to Dr. Bob’s Home. He recalled taking his young grandson through the house, telling him the story of Dr. Bob and Anne and how their commitment to help others had inspired him to take care of their house. At the end of their visit, the four-year-old grandson said he too would do anything he could to keep the house open to help people. Next, Gail LaCroix presented a brief history of AA and the role of the house in the organization’s early years. She also recounted the efforts, in the 1980s, of a group of volunteers who acquired the house as a way to commemorate the Smiths and the establishment of AA. Following these remarks several civic officials, including the Lt. Governor of Ohio, a State Senator, the Summit County Executive, and the Mayor of Akron, offered their congratulations. Their remarks not only celebrated AA as an exemplar of Akron’s longstanding community spirit but also the national significance of AA as an innovative organization that, 78 years after its founding, has a global reach. At the end of the speeches a local representative of the National Park Service formally dedicated the plaque. After the official program ended, we took the opportunity to walk through the house once more. Some things were comfortably familiar. The typewriter still sat on the dining room table and Anne Smith’s collection of books still occupied the shelves by the fireplace. Upstairs, however, the museum staff had made some changes since our first visit. 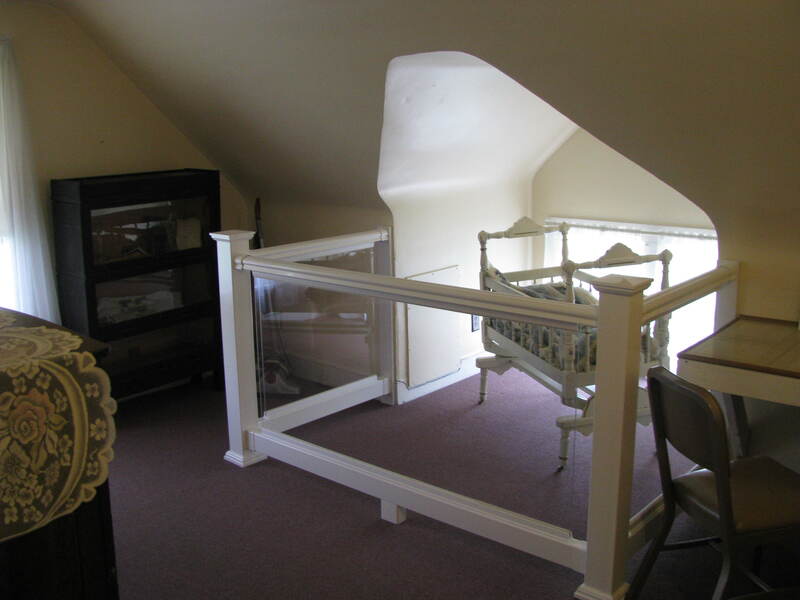 The third floor now features memorabilia relating to Dr. Bob’s early life in Vermont, including his crib. These and other changes illustrated that the museum was not a static entity, but that the volunteers we had met earlier in the day continually engage with the story of Dr. Bob and Anne. Their day-to-day work is making that story meaningful for new generations of people. As we watched the other guests walk through the house and pause to stand in the door of Dr. Bob and Anne’s room or to sit on the living room couch, we could see the emotional resonance evoked by this place. If the plaque on the front porch recognizes the historical significance of Dr. Bob’s home, it is also a place of present and immediate significance for those who visit. Far from representing a dead-and-forgotten memory, our visit to 855 Ardmore revealed that the meeting on Mother’s Day, 1935 was just the beginning of a process that continues to this day. A previous blog entry referred to the difference between this public history project and conventional academic work. Driving away from Akron and reflecting upon the conclusion of a long process we were struck by the thanks and gratitude with which we had been greeted. Capturing the intangible significance of Dr. Bob’s home was one of the challenges of writing the nomination. Revisiting the site for the dedication allowed us to see how history helps to sustain the feelings and associations people hold for the Smiths, the organization they helped to found, and the place where they lived. As historians, we believe that history matters. Seeing the deep feelings that the crowd had for Dr. Bob’s Home as a site of historic significance and contemporary healing provided a striking example of how the work that we do can extend beyond ourselves. Matthew Woodbury and Kate Silbert with Harmon Velie at Dr. Bob’s Home. ← Previous Post The Authority of What Experience?